Spring has sprung – in Coronado! The enchanted island is gearing up for one of its most popular events of the year: the 86th Annual Coronado Flower Show, happening this weekend, April 16-17. A Coronado tradition since 1922(! ), it’s the largest tented flower show in the West, drawing thousands of flower and gardening enthusiasts – locals and visitors alike – to Spreckels Park (600 block of Orange Ave.). This year’s theme is “Dig, Design and Dine.” Hundreds of colorful flower exhibits will be displayed inside tents surrounding the park’s central gazebo, which becomes the stage for live entertainment and trophy presentations. 1. Dig it… The Coronado Flower Show – of course! Coronado is always pretty as a postcard, but when you add a kaleidoscope of colorful spring blossoms it becomes that much more beautiful! 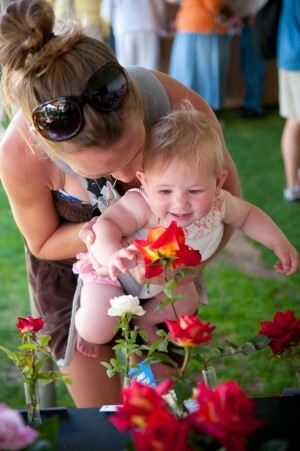 Other festivities include a flower/plant/rose marketplace, food pavilion and beer garden. Admission: $5 for adults, children 12 and under are free. Hours: 1:00 – 5:00 pm on Saturday and 10:00 am – 4:00 pm on Sunday. Don’t miss the trophy presentations on Sunday at 3:00 pm to see the best of the blooms! Coronado's gorgeous gardens also take center stage this weekend. 2. 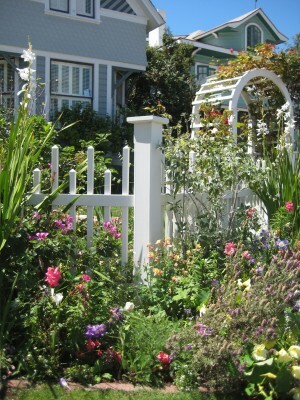 Home grown… In addition to the bounty of blooms at the flower show, view gorgeous award-winning Home Front Gardens located throughout Coronado, designated by First (blue), Second (red), Third (yellow) and Honorable Mention (white) ribbons displayed in their yards or windows. You can get a list of winners with addresses at the flower show. 3. Wheel fun… MotorCars on MainStreet is a must-see on Sunday, April 17. Check out 300 or so hotrods, trucks, custom and classic cars along Orange Avenue. The best thing: it’s free to the public. That’ll get your motor running! 4. Heart art… Art in the Park. Also in Spreckels Park, just outside the flower exhibit, will be dozens of artists from the Coronado Art Association displaying their works: paintings, photographs, wood and metal working, stained glass, ceramics and more. You’re sure to find a one-of-a-kind treasure or two! 5. Book it… Just across the street from the Flower Show will be the Friends of the Coronado Library Book Fair, one of the best and biggest annual book fests in San Diego. Hours: 9am – 5pm on both Saturday and Sunday. Here you CAN judge a book by its cover and then take it home with you – cool! See you in Coronado this weekend where the forecast is sun, fun and flowers! Also check out our San Diego-wide 5 to Try. This entry was posted in Arts & Culture, Attractions, Insider Tips, San Diego Events and tagged 5 to try, art, arts & culture, coronado, crown city, events, five to try, flowers, fun, insider tips, spring, things to do by Robert Arends. Bookmark the permalink. I love looking at the Home Front gardens. They are always so beautiful! !